← Kitchen Cow makes it to the Nuffnang Asia-Pacific Blog Awards Finals! Smiles are always welcome. On babies, on grown-ups, even on food, seeing a smile is enough to put a smile on someone else’s face. In the case of food, one of the easiest ways to do that is by packing a delicious lunch made more cute, using food you enjoy eating. First off, you need to lay down your basics. Scoop rice in your lunch box, filling half. Flatten the top so it’ll be easier to place your decorations later. Rice sticking to your spoon? Dip it in water first, before using its back to flatten. If you have baran or bento dividers, stick it to the side of rice. Pack your protein in. If it’s dry, place it directly. If it’s a sauced protein, you may want to use a cupcake liner or a bento cup to contain it. In this bento, I have karaage (Japanese Fried Chicken). Place your veggies in a bento cup then place it to fill the remaining space. If the components of your lunch are relatively dry, you can also opt to just use a bento divider between your protein and veggies. Here, I used one of my favorite instant bento fillers, a plum tomato sliced into wedges. Sprinkle it with a little sea salt and I’m a happy camper. 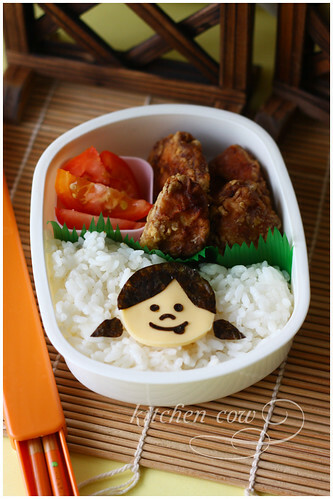 Since you have your bento basics down, now you can go and have fun. I wanted to make a smiley faced girl. I took a piece of pre-sliced American cheese, then used a veggie cutter to create a circle. If you don’t have special cutters, don’t worry. A circle’s easy enough. Just look around your kitchen for shot glasses, bottle caps, measuring cups—basically anything circular. Because you’re using it for cheese, even blunt-edged things will work. Lay cut cheese on the rice. Then, using a pair of clean kitchen shears, cut your defining shapes and details out of nori. In this case, her hair, pigtails and face. Well, actually I used a special nori puncher to create her face but that’s not necessary. Before I bought it, I used to use scissors and it worked fine. If you don’t have kitchen shears, I suggest getting a pair of kids’ safety scissors, cleaning it well (with soap, water, and a liberal application of alcohol), and keeping it specifically for food use. Apply the nori to the cheese. If you have a pair of tweezers, that’ll make your life easier. I keep a pair of fish tweezers just for handling nori. Don’t worry about it not sticking. The cheese’s natural moisture is enough to make it stick. Finished! Easy enough yes? And it can be accomplished using tools you already have in your kitchen. Now go try it and put a smile on someone’s face. This entry was posted in bento, how-tos. Bookmark the permalink. How inspiring! It sounds so easy to make. Got to buy my kitchen shears!!! Give it a shot. It's really not as hard as it looks. Thankies! I really appreciate the support. Yep, nori cut-outs using a puncher but it can be done with a sharp pair of scissors as well. But how did you make the eyes and well the face detail? Is that made out of nori too? That’s the cutest smile I’ve seen on an edible garnish. Finally took the bento leap, Kaoko! Thanks for the much-needed inspiration Hope everything’s swell in Singapore!